The Littermaid LM980 Mega Self-Cleaning Litter Box is a great litter box for multi-cat households. Designed to off your furry friends enough space to do their business in comfort, the litter area in this Littermaid model features 50% more space than other boxes. Extra high walls ensure all the litter and waste stay inside the box and not on the floor. The removable automatic rake ensures easy cleaning while the motion sensors automatically activate the box’s cleaning cycle. A safety bar was added to provide the rake stops if there is a blockage. The 10-minute cleaning cycle gives you can enough time to get in, get done, and get out. The extra time also allows the clumping litter to absorb and clump. Once the 10 minutes is up, the litter box scoops the waste into the sealed disposable waste area. Then the carbon filters begin removing the odors from the waste. If a cat enters the box before the 10-minute cleaning cycle has begun, then a new cycle will begin. No cats will be run over with the rake while using this Littermaid box. You can also select a manual clean option when you need a quick, immediate cleaning. If you only have one cat, consider looking at our page about what the best automatic litter box for multiple cats would be. We have some more options for you. Otherwise read on! 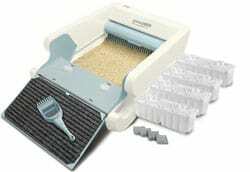 The Littermaid LM980 Mega Self-Cleaning Litter Box is one of the largest boxes on the market. You’ll need to make sure you have enough space for the unit. The box offers dimensions of 17.7 x 9.8 x 28 inches. The unit also weighs 13 lbs. It’s important to keep litter levels between the two red lines on the side of the box. If the litter gets over these lines, then the device may struggle to rake properly. During power outages, you’ll want to reset the box to “off” mode for a few minutes. The higher quality clumping litter you use in this box – the better it will work. The unit is loud enough to wake individuals who are light sleepers up at night. Keep it away from bedrooms, if possible. You cannot allow the eye sensor to get wet. This will damage the machine (sometimes permanently). Due to the large size of the litter area in this unit, we recommend this box for multi-cat households. Cats will be able to use their own “private” part of this box, which is especially important for territorial felines. However, you cannot use this box with 3+ cats unless you’re willing to change the waste compartment very regularly. The waste area is not large enough for 3+ cats on a weekly basis. Overall, the Littermaid LM980 Mega Self-Cleaning Litter Box is a great litter box for large breed cats and multi-cat households. The box features a giant litter area that allows ultimate comfort for your furry friends. The box offers cat owners extra scooping help and requires little effort on a daily basis. However, this box is not maintenance free. You will still have to scoop the sides on occasion. This is not an automatic scooping solution. You’ll still have some contact with your cat’s waste with this unit. While the unit is great for multi-cat households due to the size, you’ll be changing the waste compartment often if you have many cats using this box. The Littermaid LM980 Mega Self-Cleaning Litter Box is recommended for cat owners with larger cats or a few cats. The unit will reduce your weekly litter box maintenance and is sure to keep your furry friend happy.